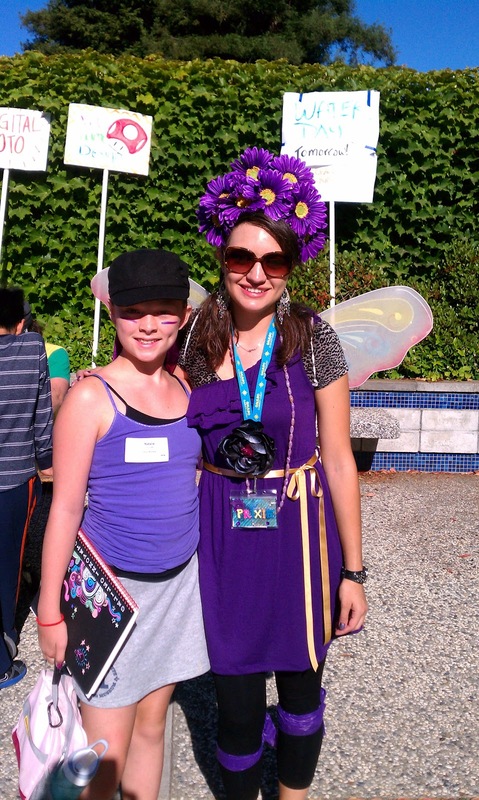 One of the things that really distinguishes Camp Galileo from your run-of-the-mill summer camp are their themes. Each week of camp is built around a theme, which ties together all the art, science and outdoor activities the campers enjoy. Each theme draws upon something unique and interesting for inspiration. Themes can center around people (Galileo, Leonardo), times (the 60's, the Renaissance), or places (the lost city of Atlantis, outer space). Still other themes are based on current events, like this year's Celebrate the Olympics (coinciding with the 2012 London games) and Celebrate the Golden Gate (to mark the bridge's 75th anniversary). 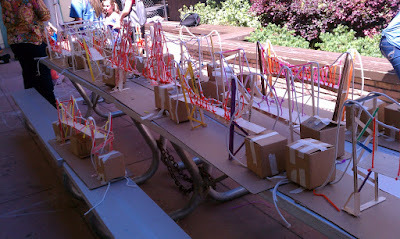 Last week my twins attended a Celebrate the Golden Gate session at Camp Galileo, and all week long they worked on projects inspired by the bridge and its surroundings. For science, they designed and built their own suspension bridge using wooden boards, popsicle sticks, wooden spools, rope, and other materials. These weren't just pieces of art; the kids used counterweights (carboard boxes filled with gravel) to hold up the bridge, and 3Po was quick to show me how the triangular tresses on his bridge towers made it more stable. He loved showing me how he tested his bridge by loading the span with cups of pennies! 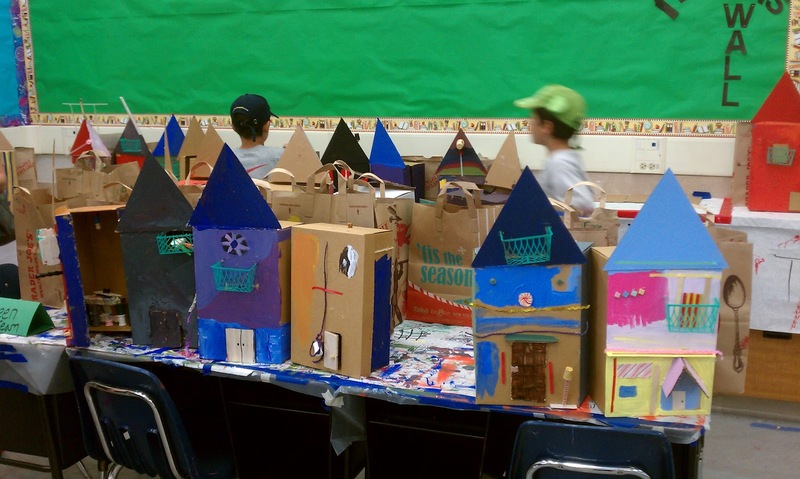 For art, they made 3-D "painted lady" models, inspired by the famous Painted Lady Victorian houses in San Francisco. The houses were adorable, and some kids had even made beds and furniture for the inside of their houses! I'm sure Polly Pocket would want to move straight in. Even the outdoor games they played were inspired by the Golden Gate Bridge: they worked in teams to figure out how to make their way across the San Francisco Bay (the playground blacktop) by hopping from island to island (rubber dots). All Camp Galileo themes are great, but I have a special fondness for Celebrate the Golden Gate, because it's based on a local landmark that my kids know and love. Even though the camp counselors didn't really talk about the Golden Gate or its history (I wish they had done this, but The Pea informed me that "It's a camp, mom, not a lecture! "), I like to think that after this week at camp, they're not just taking home some really cool projects and fun memories -- they're also taking home a renewed sense of history, and a renewed appreciation for the Golden Gate Bridge and the human ingenuity and effort required to build it. Disclosure:This is the fourth in a series of posts about Camp Galileo and Galileo Summer Quest, for which I am being compensated with a free week of camp for each of my children.. The views and opinions expressed here are my own. Disneyland is all about immersive experiences. Whether you're Soaring over California or crusing Route 66 with Mater or speeding through a Galaxy far, far away or sitting in a Clamshell as it dives Under the Sea, they have a knack for transporting visitors into the fanciful worlds they've created in their movies. This summer, they're taking out their pixie dust and shaking it all over the Hollywood Pictures Backlot to transform it into Alice's Wonderland, for their latest nighttime dance party, the Mad T Party. This is definitely not your grandmother's tea party; it's not even the crazy-but-cute tea party hosted by the Mad Hatter in the classic Disney cartoon. 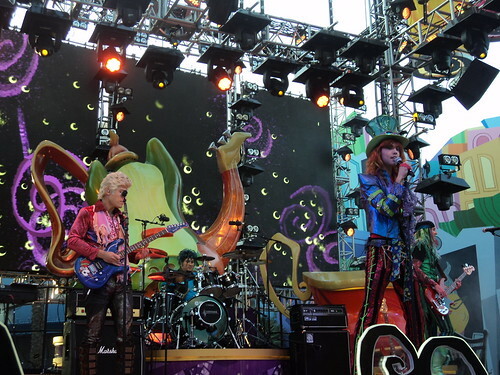 No, the Mad T Party is more like a wacky, whimsical acid trip inspired by the 2010 Tim Burton movie. 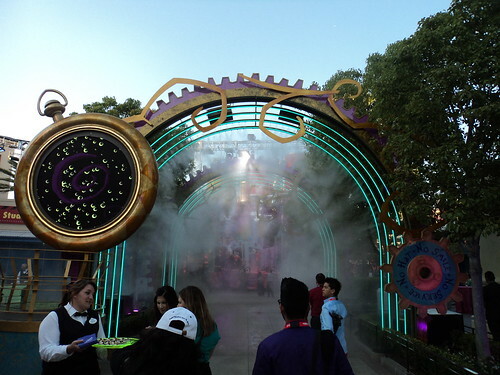 Guests enter Wonderland through the Rabbit Hole, which is basically a series of mist-spraying arches decorated with swirls and neon lights. 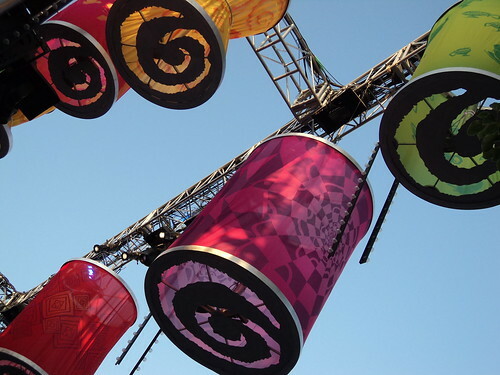 These giant lanterns are hung right above the main music stage, like the lanterns strung over the Mad Hatter's party table in the movie. On stage you'll find a live band, dressed in costumes inspired by the movie, alternating with a DJ dressed as the White Rabbit. Alice reminds me of a blonde Katy Perry -- I wonder if The Pea will want to dress like her for Halloween? She and fellow vocalist The Mad Hatter kept the crowd fist-bumping and jumping with their high-energy musical numbers. 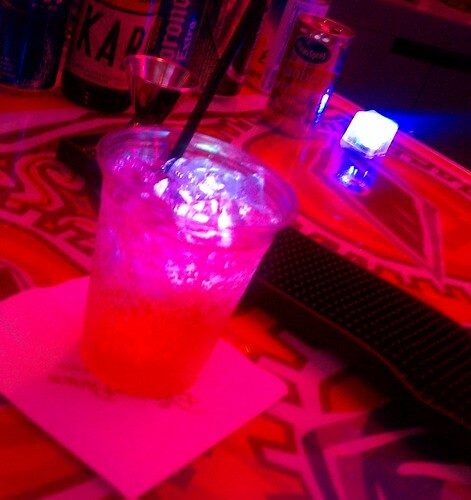 I love the Drink Me bar! You can't really see it from the photo, but the bar has a coffee table with teapots, cups and saucers hanging upside-down from the ceiling. The glow-in-the-dark ice cubes were a huge hit. Once we had finished our drinks, we fished out our ice cubes, dried them out, and took them home as a souvenir. We discovered that when you toggle the on/off switch, the ice cube colors change colors, and one setting even has the ice cube changing colors every few seconds! It's the coolest way ever to decorate a drink! Once you've got your drink, you'll want a place to sit and get a rest from the dancing. Guests can head to lounge areas, scattered throughout, and relax on Queen of Love Linvin chairs in dayglo colors, with matching coffee tables and giant lamps. 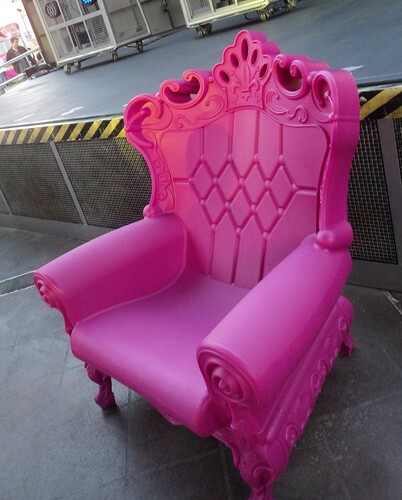 The furniture looks right at home in Wonderland, and although they look like they're made of hard, unforgiving plastic, they are surprisingly comfortable. Throughout the are, you'll see cast members in delightfully wacky outfits. These flamingo riders/stiltwalkers were enchanting the crowd the night we were there; I'm told there's also a human slinky, but he must have been stuck in his rabbit hole that night, and we didn't get to see him. A second stage, called the House of Cards, showcases a group dancers dressed as cards. They're introduced by Tweedle Dum and Tweedle Dee, who've gotten a seriously badass makeover. You'll also find the twins walking around the party area acting like bouncers. 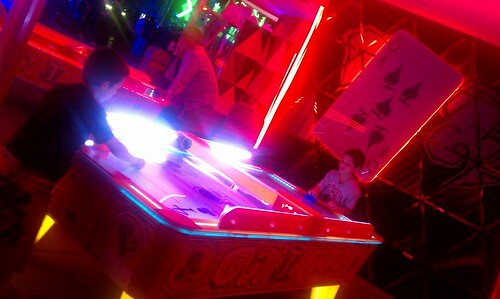 Right beside the House of Cards is the Mad Arcade, a small game arcade with skeeball, basketball, whack-a-mole, air hockey and other classic arcade games. 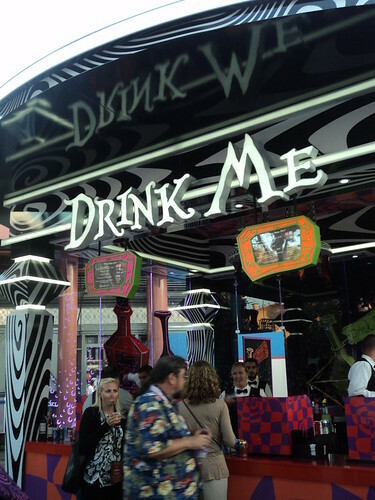 The games are themed after Alice in Wonderland (i.e. 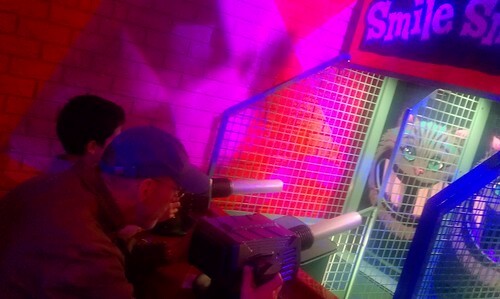 Cheshire Cat's Smile Smash, where you try to knock the Cheshire Cat's teeth down by shooting ping pong balls into its mouth), and everything is glowing in neon lights. Tokens are a quarter each, and most games take 1-2 tokens. 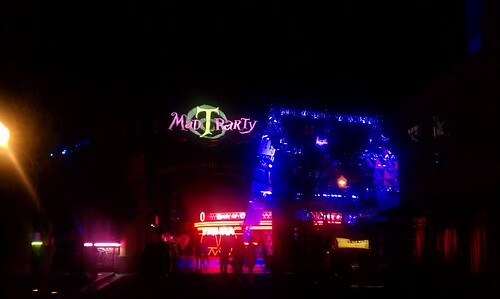 I'm told that Mad T Party is very similar to the previous dance party, ElecTRONica, just with renamed drinks and decor, but I prefer this theme because it's much more universal and beloved. The Mad T Party is Disney-fied enough for families (but see my note regarding kids at the end of this post) but cool enough for the tween crowd, so you probably won't find many people uttering the words, "It's not my cup of tea". 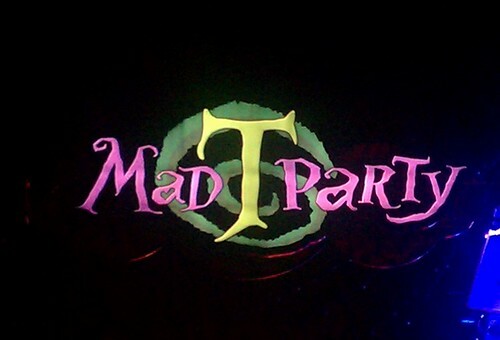 Mad T Party is located at the Hollywood Pictures Backlot in Disney's California Adventure. It will run throughout the summer, beginning at dusk and lasting for as long as DCA is open for the day. 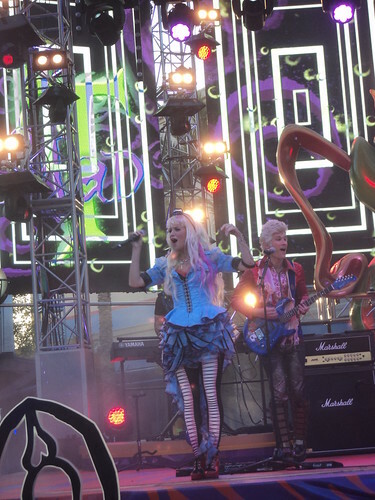 For more photos of the Mad T Party, check out my photoset on Flickr and on Facebook. Disclosure: The Disneyland Resort provided media privileges, park admission for my family and accomodations for the duration of the Cars Land opening event. Other costs, including transportation,meals and extra days at the Disneyland Resort, were incurred at my expense. The views and opinions expressed here are my own. Like most summer camps, Galileo Learning's camps (Camp Galileo and Galileo Summer Quest) run from 9:00 AM till 3:00PM, which is great for parents with flexible schedules, but not so great for parents who face the 9-to-5 grind (and not so great for the kids either, because if they had their way, they'd stay at camp till the sun goes down). To accommodate the schedules of working parents, Galileo offers extended care hours. Parents can choose from morning care (8:00-9:00AM), afternoon care (3:00-6:00PM) or both. I used Galileo's extended care for the first time this year, and I've found it really useful because 3Po and Jammy are attending Camp Galileo this week in Palo Alto, while The Pea is attending Galileo Summer Quest in Sunnyvale, and the 2 locations are 20 minutes apart. With extended hours, I can drop the boys off at extended care in the morning and get The Pea to her camp by 9:00AM, and I can pick the boys up at 3:00PM and drive to The Pea without breaking the speed limit (or the sound barrier). At the beginning of the week, I felt a twinge of guilt at leaving the kids in for such long hours -- Surely 6 hours of camp is enough! They'll be exhausted and will want to go home to unwind! -- but I quickly learned that Galileo's extended care is almost as much fun as camp itself. 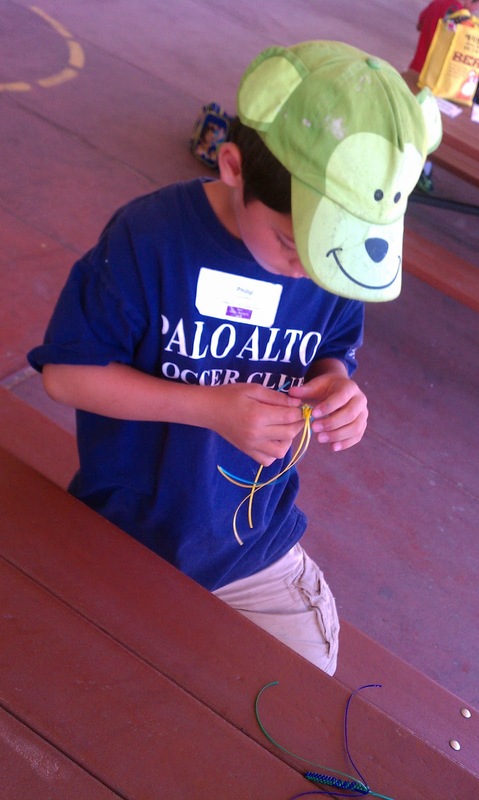 At Camp Galileo, kids can do art and craft activities (3Po and Jammy are currently OBSESSED with lanyard making) or play games like foursquare or tag. Over at Galileo Summer Quest, The Pea tells me that kids can choose to take part in outdoor sports like kickball or soccer or games like Capture the Flag, or head indoors into The Cave, a classroom where they can play card games or draw or do arts and crafts. As with pretty much everything about Galileo, what makes their extended care program truly special is their people. The camp counselors really go out of their way to make extended care fun for all the kids. Kids aren't abandoned in a tiny room, or left to mope around and get bored. The Pea told me they are always going around, trying to make sure that everyone is occupied and entertained, ready to join the kids in games or start a new lanyard for them or ooh and ahh over a drawing or organize a game -- but not in an overly pushy way. If someone wants some quiet time by themselves, that's perfectly okay. It's no wonder my kids are always asking me to leave them just a little bit longer, to pick them up just a little bit later. 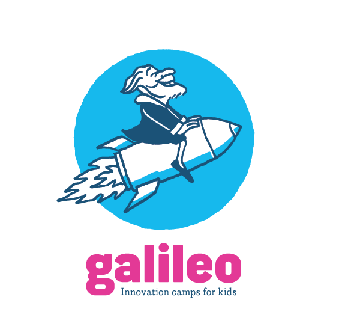 Disclosure: This is the third in a series of posts about Camp Galileo and Galileo Summer Quest, for which I am being compensated with a free week of camp for each of my children. The views and opinions expressed here are my own . I love Cost Plus World Market. I've been shopping there for years, and it's one of my favorite stores. We shop there regularly for imported goods you can't find at regular grocery stores (or if you can find them, they're a lot more expensive). All the English foods that Alfie love are there -- Patak's Curry Pastes, Heinz Baked Beans, Heinz Salad Cream, Twinings Earl Grey Tea, and Cadbury's digestives -- and thanks to this store, we can enjoy them all the time. Alfie loves their imported beer selection, and once in a while I treat the kids to a box of Yan Yan cookies (plus some Lindt chocolate for me). Every October I buy gummy eyeballs for Halloween, and every December, we buy a box of crackers so we can celebrate the holidays the English way. 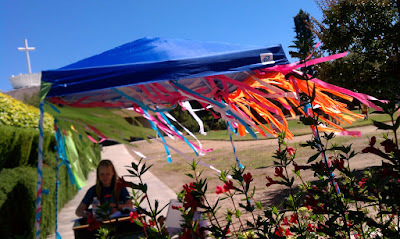 * All our outdoor furniture -- table, chairs and umbrella -- are from Cost Plus World Market. * Our kitchen table bench from Cost Plus World Market. * We drink from Cost Plus World Market drinking glasses. 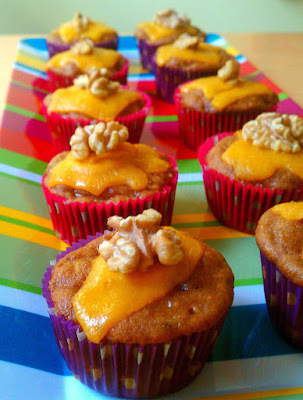 I made these cheddar apple cupcakes for the first time last year when we invited some friends over for a barbecue. They made their debut on a festive tray from Cost Plus World Market. Earlier this year, my daughter celebrated her 11th birthday with a movie night sleepover. She wanted a popcorn station and candy bar where guests could help themselves to treats they could munch on during the movie. Guess where I went to find the serving ware? Cost Plus World Market! They had the cutest popcorn bowl and cardboard popcorn containers, as well as glass dishes for the candy. They even had the cutest scoops! 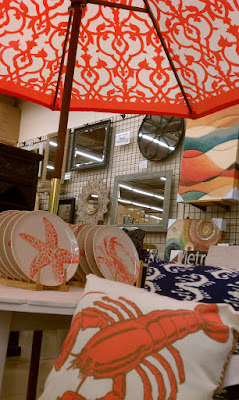 Recently I had the opportunity to add to my Cost Plus World Market treasure trove of items for summer entertaining. World Market sent me a gift card so I could check out their current stock, see what amazing deals they have going, and get my home ready for summer. 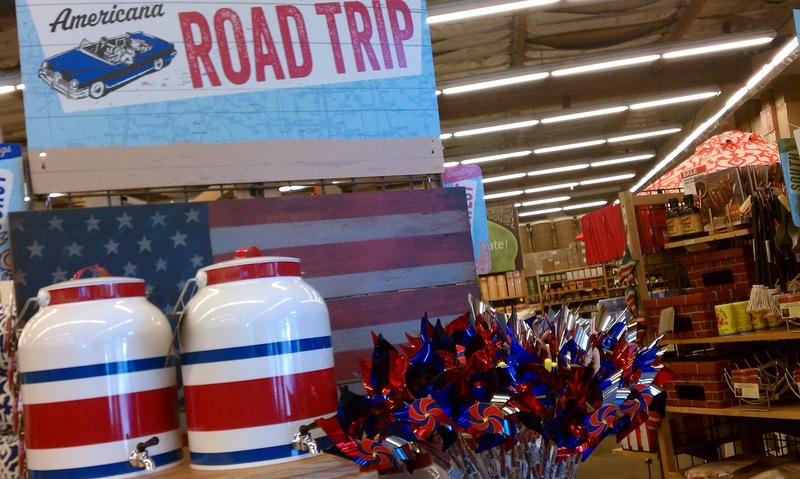 If you're planning a 4th of July barbecue, they have everything you need to celebrate! They also have a Maine Lobsterfest theme, which I think looks really gorgeous. I can just imagine Martha Stewart hosting a luncheon with the partyware and decor I saw at the store. I used my World Market gift card to buy a beautiful Mason Water Jar and stand. I love the clean, vintage look and the easy-serve spout. It seals up tightly -- no drips! 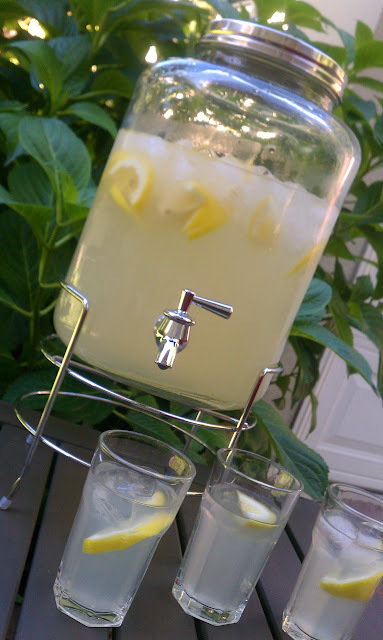 -- so it's perfect for parties where guests can help themselves to water, lemonade or some other beverage. I also bought the side table it's resting on in the photo; it's nice and sturdy and goes really well with our other patio furniture (also from World Market!). And because all outdoor furniture is currently on sale, up to 50% off, I even had enough on the gift card left over to purchase a tablecloth for our outdoor dining table. What an amazing haul! Cost Plus World Market and Southwest Airlines are teaming up to help summer flyers save! Their Buy and Fly in-store promotion lets customers receive a 15% off coupon towards the purchase of a flight anywhere Southwest Airlines flies -- all you have to do is make a $20 or more purchase at Cost Plus World Market! For more details, go to www.worldmarket.com/southwest. Enter the Summer Getaway Sweepstakes! Each week from June 16 to July 13, Cost Plus World Market is giving away a trip for 4 anywhere Southwest Flies, including hotel accommodations and a $500 World Market gift card. To enter, "like" Cost Plus World Market on Facebook, and click on the Great Summer Getaway Sweepstakes tab. Follow Cost Plus World Market on Twitter and Facebook to get all their latest news, including sales and coupons! Disclosure: This post has been compensated by Cost Plus World Market, via the Pollinate Media Group. I received a gift card to shop for home entertainment items of my choice from Cost Plus World Markets, plus additional compensation for my time. . The views and opinions expressed here are my own. Potty. Pee-pee. Wee-wee. Poopy. At some time or another, we all have to talk about the ickier aspects of going to the bathroom in public, but most of us use cutesy names instead of the more direct terms so we don't ruin the appetites of the people around us. That's why Cottonelle is searching for a creative name for their two-step bathroom process of cleaning yourself with Cottonelle toilet paper and Cottonelle wipes. Which, by the way, is an awesome process -- I'm a bidet kind of girl myself, but since we don't have bidets at home, I like to wash myself with water, then wipe dry, when I pee, but when I'm on the road I think using Cottonelle wipes is the next best thing. Anyway, back to the naming. 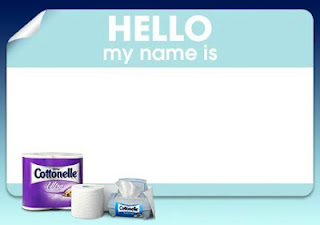 As I mentioned, Cottonelle is searching for a witty, funny-yet-tasteful name for the Cottonelle® Care Routine (paper + wipes), and they need your help! They have a fun Name It generator on their Facebook page where anyone can create and share a witty name. You can create a name with their randomizer, customize a name to match your personality and toilet care habits, or come up with a name that's entirely your own. Submit your name to Cottonelle, and you can enter for the chance to win a year's supply of Cottonelle products! Two winners will be chosen each week (on Two-Step Tuesday, naturally) until February 25, 2013. (For full details and rules, go to the official contest rules page). * Since we're going to the London Olympics in a couple of weeks, how about Winning Wipe or Gold Medal Grind? * Since we'll be in the UK, I thought it would be good to use the local lingo. Everyone in London will understand Lovely Loo! Now it's your turn -- what name would you choose? Share your name and you could win the giveaway below! Come up with your own name using the Name It widget above, then leave a comment on this post and tell me your name. This entry must be completed before any extra entries will count. 4) Like Bonggamom Finds on Facebook (1 entry). 6) Host the Cottonelle Name It widget on your own blog (1 entry). This giveaway ends at 11:59PM PST on July 22, 2012; I will draw a winner at random on July 23 and post his/her name after she/he confirms acceptance. For additional giveaway rules, click here. Disclosure: Thank you again to Cottonelle for sponsoring my post. Visit them on Facebook to share your name! I was selected for participation in this program by the Clever Girls Collective. The views and opinions expressed here are my own. And even though buffalo wings and nachos may not be totally obsolete, men are beginning to care about what they eat, so they might even serve fruit and nuts along with the junky snacks. Since men are taking bigger steps toward good health, Planters has teamed up with Men’s Health magazine to create Planters NUT•rition Men’s Health Recommended Mix, specifically designed to provide what men – and dads – want in a snack: three nuts they love (almonds, peanuts and pistachios) with heart health benefits, six grams of protein, six vitamins and minerals and a good source of fiber. The new mix is also endorsed by the editors at Men’s Health magazine. Planters recently sent me some samples of Planters NUTrition Men's Health, and Alfie really likes them! He eats raw nuts every day so the fact that he like these is really saying something. They are wholesome and filling, and most importantly, not too salty. I love the fact that they come individually packed, because it makes it so much easier for me to pack something healthy for Alfie in his lunchbox. samples of Planters NUT•rition Men’s Health Recommended Mix. Leave a comment on this post and tell me what you think is the best characteristic of today's Modern Man. This entry must be completed before any extra entries will count. 5) Like Bonggamom Finds on Facebook (1 entry). This giveaway ends at 11:59PM PST on July 15, 2012; I will draw a winner at random on July 16 and post his/her name after she/he confirms acceptance. For additional giveaway rules, click here. Disclosure: Planters is providing the giveaway prize as well as a sample pack of Planter NUTrition Men's Health for me to review. Product information (in italics) and infographic were provided by the featured company/product. The views and opinions expressed here are my own. I always say that my favorite place in the entire USA is Yosemite National Park. I've been there 6 or 7 (or is it 8? I've lost count!) times, and I never get tired of it. Everywhere I look, I'm treated to picture-perfect views, and I love being surrounded by so much beauty. Do you (or those you know) love exploring the great outdoors? Now you can travel America in high definition and experience some of the world's most amazing natural wonders right in your own home! Yosemite -- The Sierra Nevada's mountain range contains some of the most amazing wonders found on the planet. Grand Canyon -- A thrilling exploration that uncovers the geology of the Colorado Plateau and the forces that have shaped this marvelous landscape. The Everglades -- Plants and animals combine in a sub-tropical tapestry of ecosystems that is unmatched anywhere in the world. The Black Hills and the Badlands -- A land of soaring pinnacles, deep canyons, hidden caves, national monuments and countless wildlife sanctuaries. Visit this page and use the code PARKS25 to save 25% off a National Parks Exploration DVD. The code expires on July 4, so use it soon! One lucky Bonggamom Finds reader will win a National Parks DVD set! Like Mill Creek Entertainment on Facebook AND leave a comment on this post telling me your favorite National Park or landmark. This entry must be completed before any extra entries will count. 2) Blog about this giveaway, making sure you include a link to the giveaway (http://bit.ly/NPFfBz) in your blog post (1 entry). This giveaway ends at 11:59PM PST on July 19, 2012; I will draw a winner at random on July 20 and post his/her name after she/he confirms acceptance. Continental US residents only. For additional giveaway rules, click here. Good luck! Disclosure: Thanks to Mill Creek Entertainment for providing a DVD 4-pack for review and one for giveaway. Product information is provided by Mill Creek Entertainment and is indicated in italics. The views and opinions expressed here are my own. The Pea is totally addicted to the Disney Channel. Not a day goes by that she doesn't watch an episode of her favorite shows "Good Luck Charlie", "Ant Farm", "Jessie" or "Shake It Up" (and on days when I'm not watching her back, she'll sneak in all four!). They're all good, wholesome shows so I don't mind her watching (and I have to admit, I like Good Luck Charlie and Ant Farm too). She was really bummed at the prospect of going without her Disney Channel fix for a whole month while we're in the UK, but now that the Disney/ABC Television Group has launched their new app, WATCHDisneyChannel, she won't have to. Their new app lets you watch the most popular Disney Channel shows on your iPod,Touch, iPad or iPhone, so you can watch on the go or wherever you have a wifi connection. The Pea couldn't be happier! The app features a selection of episodes, which change all the time, so you don't get stuck with nothing to watch the day after your Disney Channel marathon. If you're a Comcast customer, you can even access a live stream, and get next day episodes -- which means that The Pea can watch it all on the iPad, which means one less person to fight for the tv remote control! Don't worry, there's plenty of content for non-Comcast users, but the Comcast customers basically get the whole channel online, plus on-demand access to the episodes. Android phone or tablet users, unfortunately, do not get the app, which is a major bummer, but you can still watch online at www.WATCHDisneyChannel.com. Also, Disney/ABC have 2 more iOS apps for fans of Disney XD and Disney Junior (and both are online at www.WATCHDisneyJunior.com, and www.WATCHDisneyXD.com). Disclosure: I received media access to the Comcast version of WATCH Disney Channel to review. Product information is provided by the featured company/product and is indicated in italics. The views and opinions expressed here are my own. Like many parents, I like to pack kid-friendly snacks in my kids' lunch boxes: applesauce, fruit cups, cheese slices, granola bars, fruit roll-ups, that sort of thing. They're easy and convenient, my kids love them, they provide good nutrition (if you choose the right snacks, of course! ), and they're sized just right for kids. However, even though many snacks come in kid-sized and/or kid-friendly packaging, the nutrition information on their labels are still geared towards adult's portions -- so that 200-calorie granola bar you've packed for your 8 year-old is actually 15% of his recommended daily calorie allowance, not 10% like it reads on the label (which is based on the average adult's 2000 calorie daily intake). Instead of guessing about how much a particular snack food contributes to your child's daily diet, you can check out CLIF Kid's new conversion tool on their website, which converts the percent daily values you see on nutrition labels to more appropriate percent daily values based on your child's age. 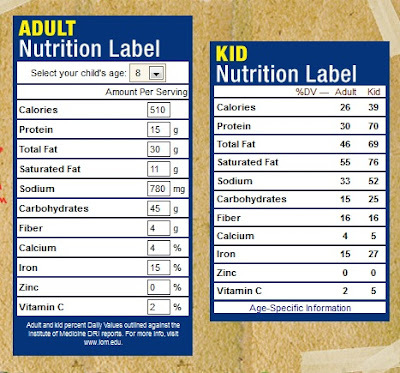 Just type in the nutrition values you want to compare (calories, fat grams, protein, carbs, etc..) and select your child's age, and it will show you the kids' version. By the way, in case you're freaking out over those values (76% daily value of saturated fat! 52% daily value for sodium! ), you should know that I typed in the nutrition information for a serving of frozen chicken pot pie. Please don't call the kid nutrition cops on me, because I don't serve my kids frozen chicken pot pie for a snack! I much prefer wholesome snacks like CLIF Kid bars, and fortunately, so do they. Their Z-Bars are a household favorite, and we always keep a supply on hand to throw into a bag when we go to the park, on a road trip, or to summer camp. Their newest flavor, Cookies 'n Cream ZBar Crispy, is a big hit with the whole family. It reminds me of a cookies 'n cream-flavored rice crispy bar, so what's not to like? I don't even need to tell the kids it's a wholesome snack (with as much iron as 2.5 cups of spinach and as much zinc as 2 cups of peas), because they'd want to eat it anyway. And since it's already in a convenient kid-sized serving, I don't need to constantly refer to the CLIF Kid conversion tool to be reassured that my kids are getting the right nutrition, in the right amounts. Disclosure: I received samples of CLIF Kid's Cookies 'n Cream ZBar Crispy to review.. The views and opinions expressed here are my own. Fans of English Premier League soccer have had an awesome season! Alfie has been watching the EPL all his life, and he says this season was one of the most exciting ever. All year long, the Premier League table has shifted and turned on its head, and the EPL Championship wasn't decided until the very last game of the season -- actually, until the last few minutes of the game! That was when Sergio Aguerro scored a goal against Queen's Park Rangers to put Manchester City ahead, grab the title from Manchester United and make the Blue Side of Manchester the EPL Champions for the very first time! After such an exciting finish, summertime is positively anticlimactic, but fortunately this year we're enjoying EURO 2012, and we have our quarterfinal soccer game in the Olympics to look forward to! That's why 3Po and Jammy are enjoying their EA Sports FIFA Soccer 2012 game for the PS Vita more than ever. They know all the EPL teams by heart, as well as many of the top European league teams (Real Madrid, Barcelona, Bayern Munich, etc...) and National teams (Netherlands, Spain, Germany, etc...) so they really love being able to assemble their own teams and play them virtually against each other. EA SPORTS FIFA Soccer on PS Vita gives you the same physics-based, data driven technology that powers FIFA gameplay on PlayStation3. Take part in eight different game modes, including 11 vs. 11, Tournament Mode with over 50 real-world competitions, a full in-depth Career Mode, and compete online with Head-to-Head matches against your friends and gamers around the world. Create custom online leagues with your friends and compare your online performance with global and friend focused leader boards. Innovations that utilize a rear touch pad and touchscreen create an intelligent and unique gameplay experience. Rear touch pad shooting delivers pin-point accuracy and removes the element of “hit and hope” from shooting and touchscreen passing opens up the field of play for more creative and precision passing. * The graphics are superb, giving them a visual experience that matches the one on the PS3. They've included details like the crowds and the stadium banners, and the players' features are more recognizable, so you can really see that it's Wayne Rooney slicing the ball past Joe Hart in the photo above. * They can easily form teams from years past, not just from the current 2011-2012 team lineups. Players are always being traded from team to team, some retire from international competition, some retire for good, so teams are always changing, and this feature is great if you've been a fan over the years and have a favorite team. For example, if I think that the Netherlands team that played in the 2010 World Cup should have won against Spain in the finals, I can easily assemble both 2010 teams and give them a rematch to see which team ends up winning. FIFA Soccer 12 definitely engages my boys for hours on end. They really get into it, as though it were a real game on TV -- although I hear quite a bit of laughter when they play and have the soccer players do goofy things like miss a penalty kick or mess up a scissor kick. I feel good knowing they're being entertained without having to virtually blow up helicopters or people's brains, and they have a good time playing the game they love, even when they're in the car and can't actually play it. If you're a soccer fan and a gaming fan, the FIFA Soccer games are a must -- and there's no better way to get your kicks on the go than by playing FIFA Soccer 12 on the PS Vita! Disclosure:As a PlayStation Family Blogger, I received a PS Vita loaner and assorted PS Vita game titles . The views and opinions expressed here are my own. CarsLand -- it's finally here!